As someone who grew up many hundreds of kilometres from the nearest mountain with snow, I always accepted from the cartoons and popular culture that that was a natural phenomenon, but I've never seen any evidence for it (avalanches not withstanding). 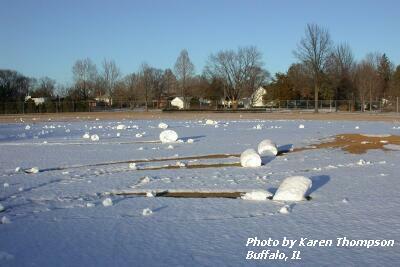 Do rolling snowballs grow in size, as depicted in popular culture? Only when the snow is "wet", not if the snow is powdery. The popularity of the Watson continues to grow like a snowball rolling down hill on a wet day. • The ground surface must have an icy, crusty snow, on which falling snow cannot stick. • About an inch or so of loose, wet snow must accumulate. • Gusty and strong winds are needed to scoop out chunks of snow. Snowfall of 1 to 4 inches occurred across central Illinois the morning of February 11. That evening, as a strong cold front pushed through the area, wind gusts of 40 to 60 mph were noted in many areas. Once the initial "seed" of the roller is started, it begins to roll. It collects additional snow from the ground as it rolls along, leaving trails behind it. The appearance is similar to building snowmen, except the snowball is more log-shaped rather than spherical, and many times they are hollow. They can be as small as a golf ball, or as large as a 30 gallon drum, but typically they are about 10 to 12 inches in diameter. I would have to say, yes, it does, but as evidence, one looks not at the scenario described of rolling a snowball down a hill. Instead, in a snowy area, after a significant snowfall and, especially, if it leads to a cancellation of school, go outside and observe children and/or adults building snowmen/women. How do they build the "snowballs" that are the body parts? There is an initial mounding of snow to create a ball, but to build it into much larger snow boulders, one simply rolls the ball around in the snow, and it increases is size as it picks up more snow from the ground. The reason why this happens is because snow will stick to other snow because of slight melting. The pressure of hands pushing the ice crystals together or the weight of the snowball pressing down onto snow on the ground causes slight melting at the surface, causing the crystals to stick together. So, if you have really light, fluffy snow, and brutally frigid temperatures, snowballs won't pack very well, and certainly would not accumulate just from rolling onto more snow. The reason has to do with why snow sticks together in the first place. Snow is basically ice crystals , and when you pack the crystals together, you need to apply enough pressure with your mitten-clad hands to get some of them to melt. This concept obviously applies to larger snowballs as well, which are the foundation of my "snowmen" scenario. First, let's talk about the snow. "Snow can either be too wet or too dry," points out Dan Snowman, a physicist at Rhode Island College in Providence. Scientists actually classify snow based on its moisture content - the amount of free water relative to ice crystals - not to be confused with the amount of water the snow would produce if melted. Snow comes in five categories: dry (zero percent free water), moist (less than 3 percent), wet (3 to 8 percent), very wet (8 to 15 percent), and slush (more than 15 percent). By that scale, moist to wet snow is ideal for snowman building, according to Jordy Hendrikx, a snow scientist at Montana State University. Dry snow is like a loose powder with particles that don't stick together very well, while slush is too fluid to hold a shape. "You can think of free water as the 'glue.' You need enough to stick the crystals together, but not too much." As far as the actual phenomenon of snowballs rolling down a hill, there are probably too many variables in terms of weight, pitch of the hill, initial velicity, moisture content, etc for me to properly find comprehensive analysis that in the space permitted, but most probably the answer is "yes, under the right conditions" for that, as well. Not the answer you're looking for? Browse other questions tagged physics meteorology .